Plans to implement a residential parking plan throughout the City of Newport received mixed reviews at last week's city council meeting. There is no formal plan on the table and no public details on how such a plan would be implemented or how much it will cost. City commissioners, at this point, are only discussing the proposal with City Manager Tom Fromme. On Monday, representatives from a company called CDO Technologies presented the type of reader system that could be used by law enforcement and parking authorities to determine the validity of city parking stickers. 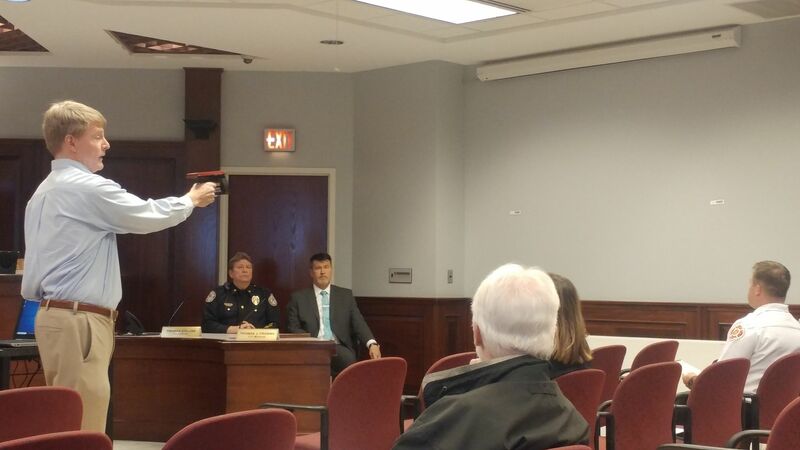 Stickers were placed on the wall of the city commission chambers and then zapped by the gun-like device that had a smart phone affixed to it. The stickers would cost between $1 and $3, while each device would cost under $2,000, said CDO's Robert Zielinski. CDO does not currently provide its technology for any city's parking enforcement, though cities like Dayton, Ohio and Los Angeles have turned to the company for other reasons, such as auto-gate entry or keeping tabs on aging asphalt. Newport resident Robert Yoder, who is also economic development director for the City of Dayton, Ky., spoke against the proposed plan. He noted that twenty years ago, the city commission voted to end its long-standing residential parking program. "I've been here so long, I remember when three of you voted against parking stickers and cheered when we stopped doing it," Yoder said, referring to city commissioners Beth Fennell and Ken Rechtin, and Mayor Jerry Peluso, who was previously a city commissioner. All were on the city commission twenty years ago. "I don't think cities - we're not good at running these types of programs," Yoder said. "We're open from 9 to 5. When do (residents) work? From 9 to 5. It's really not good for administration." "It's already failed once. The City of Newport is not good at this." York Street resident John Young told the city commission that he would support a residential parking program. "We have no parking in front of our house," he said. Parking is impacted by businesses and events, he said. "We would definitely appreciate residential parking." "Twenty years ago it came down to priorities," Mayor Peluso said. "Different things happened during different times. Our interest was in another direction." "This is early in the ball game. We're just gathering information." Fromme, the city manager, said the issue was more complex and that the city has talked about such a program for three years. "It's not so simple," Fromme said. "Twenty years ago is totally inaccurate. Twenty years ago was the final coup de gras of a dying program because of bad decisions made twenty years before that." Fromme, who previously served as police chief, including when the city had a sticker parking program, said that it was a vibrant and working program and that there was a strong enforcement arm and it generated revenue. But when the stickers were changed to tags affixed to license plates that police officers couldn't see, the program became more labor intensive. "They had to physically get out of the vehicle," Fromme said of the officers. The parking stickers also started to expire on birth months rather than a uniform calendar designation. "So now you had twelve different sets of expiration instead of one yearly expiration," he said. Currently, the city commission is exploring a set fee with some free opportunities for homeowners. Those with stickers would also be able to park free at city parking meters, Fromme said of the early conversations. It was not clear when an ordinance would be presented for a vote by the city commission.